Each one of us has a different definition of the difficult subjects. You will never meet a student saying, I love to read every subject of my course. All of you will agree that there would always be a couple of subjects that we do not want to study. We become bias even in studies. Some subjects we love to read over and over again and some subjects we start studying only a few weeks before exams. Every time we plan to study a difficult subject, our plan gets postponed. It happens many times and with all of us in every stage. In school, some students hate History, some Maths, some of them do not like Hindi, and some hate to study Science subject. In college even if we choose a stream of our choice (some prefer Science, some choose commerce, some go for humanity etc.) then also we find some subjects difficult. As we go onwards to a higher grade level, it gets more difficult to tackle these subjects. These scenarios also happen when we start preparing for any competitive examinations, and we have to prepare a lot of different subjects, some we like and some we dislike. All of us have unique learning pattern. Based on a particular way of understanding and capability each one of us understands one subject and could not understand another. The one which we are not able to understand easily becomes the most disliked subject for us. To qualify in the examination, we all have to deal with these subjects. So it is better to make them our best friends and deal with difficult subjects in certain ways. Here is the step by step solution to make a difficult subject interesting and easy. If you are not able to understand any particular subject or you have listed it in the difficult subjects, this means that your basics regarding that subject are not clear. Study the concepts from previous classes first. You can also study the fundamental books to clear basic concepts; it may be school level books of that subject or books of previous classes. Reading basic books first is always a good option because you can learn from them quickly and can understand every concepts or fact easily. And it helps you when you start with your high-level books. When you go through the syllabus of any competitive examination, one can quickly figure out that all the topics are already covered in school or college, and the only difference is; now the level of exam is, of course, the higher and questions are being difficult. But if you are clear with your basics, then you can easily understand the difficult level with little effort. You may find this step time consuming, but it will lessen your effort to deal with difficult subjects. You have to follow this step if you really want to crack the difficult subject. It is hard to study the subject which we dislike the most, but have some courage and start reading the course book. Even if you do not understand anything, give it reading like a novel. Take a target to complete the topic/ subject even with less or no understanding. It will benefit you later. Go slowly and finish it. Try to figure out the overall framework of the subject. After reading, you will get an idea of subtopics, and you will be able to remember 20-30% details of it. I agree that we cannot jump to solve the questions of the toughest subject we have just finished reading without willingness. But read/solve the last 3-5 years questions with its explained answers. With this process, you will get an idea of questions that have been coming in exams. By solving question just after the first reading, you can relate the topics and subtopics from where the question had been picked in the exam (here the first reading will help you to locate the questions and to know the nature of questions being asked in the examination). You will develop an idea of understanding the topics and how you will proceed with the topics in your second reading. This process will also generate some interest in your mind for the subject. In first reading you had have to force yourself to complete the topic/ subject but after solving questions you develop an interest towards the subject, and it seems less complicated. After this step, your understanding will be increased for the subject. Once we develop an understanding of a subject, it seems less difficult and can be handled easily. Step 4: Read the topic/ subject the second time. Give the topic second reading just after you are done with practicing questions. When you read the topic/subject for the second time, you will be more interested in reading, and this time your understanding will be more because you have read those questions and explanations. You will get a deep understanding while reading it the second time. You also learn how to form a question by yourself and answering them. This way you will be able to remember concepts/facts. Note: In second reading keep underlining or highlighting the important lines or paragraph. Give that subject or topic third reading after a week. Pause at every paragraph, recall the questions you had solved and formed in your mind. In your third reading, you should make short notes for the subject/topic. Making short notes of whatever you have studied give lot of benefit. It cemented the topics and concepts in your mind, and the boring or tedious subject will not be difficult any more. You can take the revision of those short notes any number of times with super clarity in your mind, of the topic as well as related questions. Discussions in a study group will make your understanding deeper. Join the subject group online or offline and take part in discussions. Discuss your knowledge of any topic. It will increase the thinking level, and you will memorise the concepts easily. Step 7: Give the second test with full confidence. Again give the tests and solve some new questions. This time you will be able to solve questions without looking at their answers. This step will complete your learning process of a difficult subject. Now you will see that one forceful move to complete the toughest subject has now increased your interest in that subject and the subject has become your friend. Do not plan the tough subject just before the exam. Start these subjects very early. 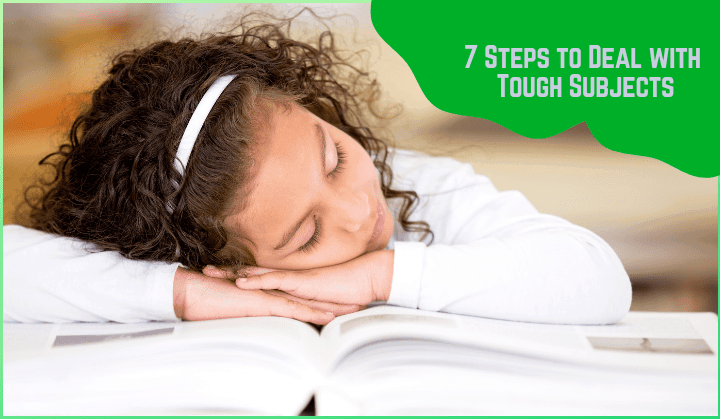 Once you complete the tough subjects, you can quickly complete the easiest subject before the exam. You will also get maximum time to revise the difficult subject. Completing the whole subject will take time and planning it before the exam can increase hassle and you will not be able to focus on understanding. Do not cram the subject/topic. Understanding is required to deal with any subject. If you do not focus on understanding, soon you will lose interest. Use different memorizing techniques to remember. Use a highlighter or different colour pen while reading books for the second time. It will make your revision very precise to the important ones and at the same time very interesting as well. You can refer to another book of the same topic just for more understanding. But do not read so many books of the same subject/topic. Focus on revising the same book multiple times. You should be patient enough while you are reading the book for the first time. You can make studies interesting by using different techniques, to ensure continuity. When we start studying difficult subjects, we target only on completing the book, so we lack a focus on understanding the concepts and facts. If needed search online about the topic, watch lectures available on YouTube related to the topic for quick understanding. Following these techniques may not master you in the difficult subject but will definitely kindle your interest. And if you have to learn the subject anyway why not make it enjoyable. Good insights on learning habits , very useful for the aspirants UPSC. This article is very useful and relatable. since i also used to face this from school life. According to my point to make subject easier 1.start with a real problem without moving to books. 2 learn in short try to understand. 3.remove mental blocks about your intellectual capability. 4 get engaged by solving problems. 5 learn the basic first. Thanks a lot. Your tips are very helpful a d I think that for now I will easily and differently handle the study of difficult topics Thanks to you.